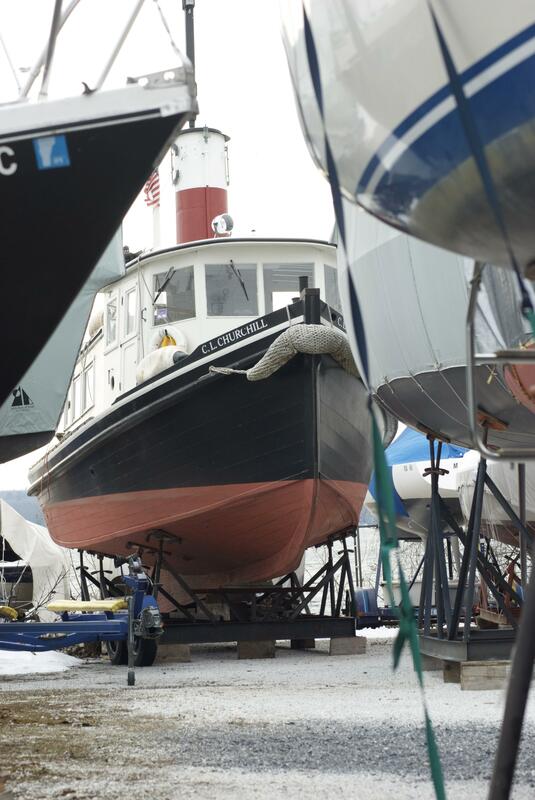 Every winter the time comes when the snow falls and the boats must be buttoned up for the winter. Each boat has its own particularities for covering – some only need a quick wrapping with a tarp (the pilot gigs), others must have an entire structure built over them which is then covered with a particular type of plastic (the Lois McClure). Recently, Erick Tichonuk and I covered the C.L.Churchill, currently residing in the Shelburne Shipyard. It was a fairly straightforward procedure, and pretty exemplary of what we do with most of our bigger boats. It took most of a morning, one ladder, 100′ of rope, 2 tarps, one box of screws and a handful of 2x4s. The first task with covering the tug is finding it. Since Shelburne Shipyard graciously continues to donate the winter storage space for the Churchill, they put it wherever it fits best. This means that when we come to cover it, we usually spend a minute searching through the yard to locate it. Once the boat is located, the materials are laid out. A quick once over of the procedure is done, and we dive in. First the frame goes together. This often involves much head scratching and “How did we do this last time?” type of questions. All of the frameworks are custom made, and not many have any plans for them. Most of the parts have been labeled (“Churchill Cabin Top 2 Front of Stack” for example) but on some the labels have faded, and some have been replaced and not labeled. After much test fitting and questioning, the frame is screwed together and ready for a tarp to cover it. For the Churchill, we used two 20×30′ tarps. Since the boat is only 33′ long and sitting very high off the ground, we had the 30′ dimension going over it, wrapping it like a present. The two tarps allowed the smoke stack to stick through with no drama (no need to cut a hole out for it), and still achieve good cover over the whole boat. Stretching these tarps out and hauling them up over a framework is always a bit tricky, especially if there’s any kind of wind. 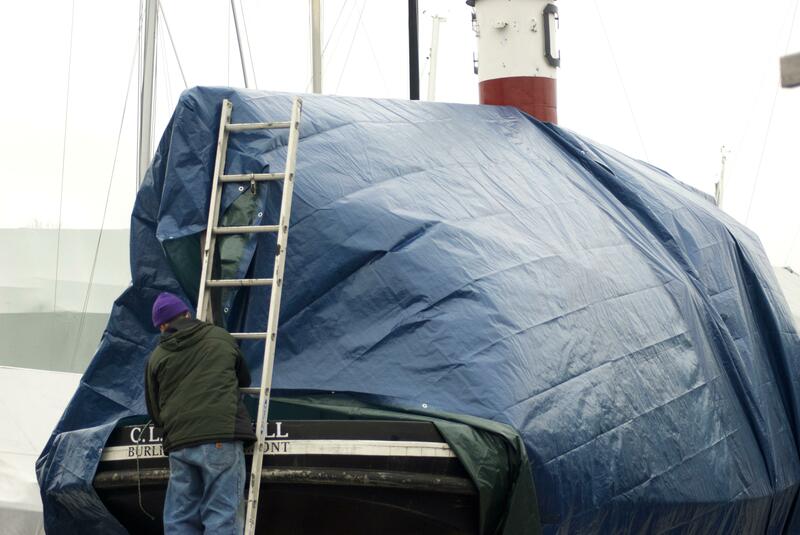 The tarps are more than happy to try and turn the tug into a sailboat. After some struggling, quick thinking, and a bit of near flight, the tarps are securely fastened to the cradle supporting Churchill. Final lacing makes sure that the tarps won’t get caught by odd wind shifts, and yet it will still be possible to get into the boat, should the need arise.